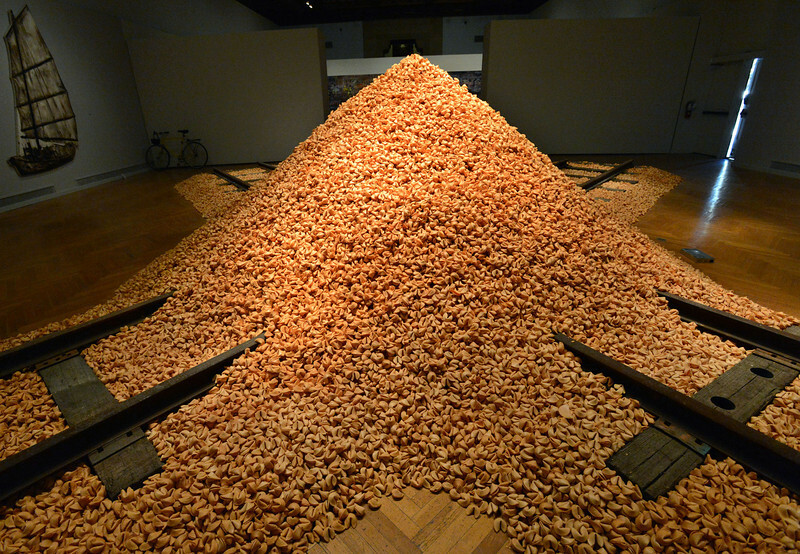 Hung Liu's "Offerings" will be on display at the Mills College Art Museum in Oakland through March 17, 2013. 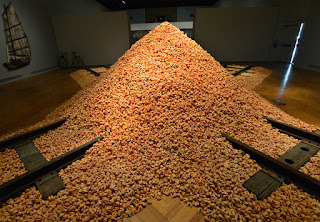 The show is a companion to Liu's upcoming retrospective at the Oakland Museum of California (opening March 15, 2013) and features several large-scale installation works, including Old Gold Mountain (1994), a mound of 200,000 fortune cookies atop a crossroads of railroad tracks. 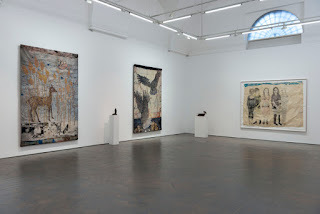 The back room is devoted to Liu's installation of antique Chinese dou (food containers), Tai Cang (Great Granary), as well as a large-scale mixed-media mural and a suite of prints, both created by Liu at Magnolia Editions. Hung Liu - Music of the Great Earth VI, 2008. The mural seen at Mills was originally realized in 1981 as Music of the Great Earth, a 50 foot wide painting in the Foreign Students' Dining Hall at the Central Academy of Fine Arts in Beijing, where Liu received her graduate degree. In 1978, the artist had attended an exhibition in Beijing featuring centuries-old musical instruments unearthed in a recent excavation in the Hu Bei province. In a 2,400 year old tomb, archaeologists had discovered a 125-piece orchestra and 25 musicians. The ensemble of Chinese string, wind, and percussion instruments on display included a set of Bian Zhong bells (visible toward the left hand side of Liu's composition) ranging in size from eight inches to five feet tall; the set of bells is so enormous that players must stand and strike them with large mallets. Liu’s studies and drawings of the Hu Bei instruments became the basis for Music of the Great Earth. In 1993, when Liu revisited China, she found that the former Dining Hall had been relegated to storage space; her mural, neglected for years, sat silently behind stacks of chairs and tables. In later years, Liu was told that it had finally been destroyed. Hung Liu - Music of the Great Earth III, 2008. Liu used the large-scale printer at Magnolia Editions to create a new mural based on her earlier design, Music of the Great Earth II, which she further layered with hand-painted, autobiographical elements. She also printed a series of smaller Variations, which introduce new passages of color, texture, and figuration to her 1981 composition, on Hahnemuhle cotton rag paper at Magnolia Editions in 2008. Music...II and all of the Variations series are included in "Offerings." We highly recommend experiencing this show by Liu, hailed as "America's most important Chinese artist" and one of our favorite people! Hung Liu - Music of the Great Earth Line Drawing, 2008.